At ISE 2014 in Amsterdam, AKG launched the WMS420 wireless system, a versatile and high-performance single-channel wireless system designed for smaller venues such as schools, town halls and houses of worship. 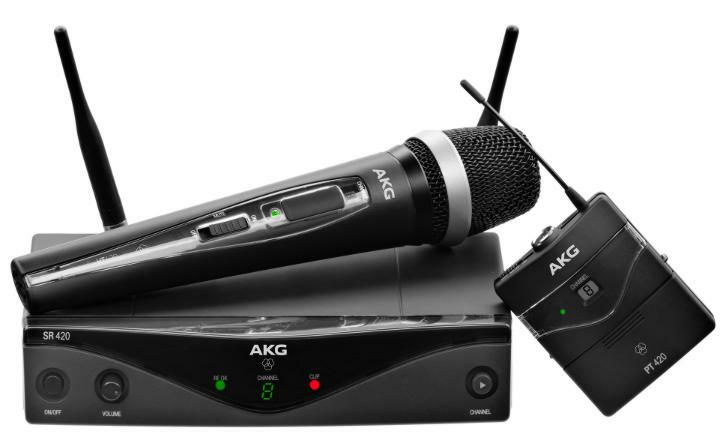 AKG offers four specialized product packages: Vocal Set with AKG D5 handheld microphone, Presenter Set with AKG C555L, Lavalier Set with AKG C417 and Instrument Set with AKG MKG L cable. WMS420 is designed for ease-of-use, following in the footsteps of the successful AKG WMS470, an 8-channel system with automatic frequency setup and the ability to immediately find and display all available channels. With WMS420, rack installation is quick and easy, especially with its detachable extended antennas that attaches to the back of the receiver. The HT420 handheld transmitter's and PT420 pocket transmitter’s charging contacts, like the AKG WMS470, are compatible with the AKG CU400 charging station and include a rechargeable battery.